Autumn is here and that means we will be breeding our sheep soon. I really find it amazing how rams change during the late summer and early fall in preparation for breeding. Above are 2 photos of our newest ram, Raulie. The photo on the left was taken when we got him in April and the one on the right is from yesterday (September 30th). You can immediately see differences in his facial features – his face is more wrinkled and swollen now. 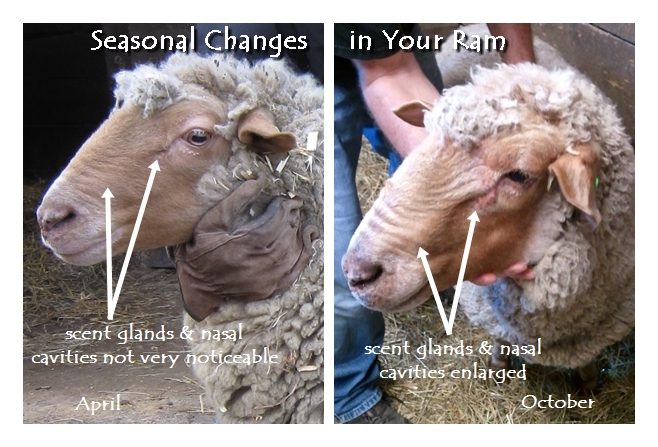 As soon as you come close to (most) breeding rams, you will notice a major change in them … their scent. Most rams smell musky during breeding season (or rut) – and some smell more than others. Sheep have scent glands between their toes and next to their eyes. You can see in the above photo how the scent glands next to Raulie’s eyes have increased in size to produce the musky odor that comes with the breeding season. The ram’s olfactory sense is heightened during rut so that he can more easily detect when a ewe is in estrus (heat). To accommodate this, the nasal passages swell so that the surface area is increased. Sheep also have a specialized organ above the roof of their mouth called the vomeronasal organ that aides in their sense of smell. When the ram smells the ewe, he breathes into his nose and mouth. Her scent is picked up by his olfactory cells and the vomeronasal organ and he raises his head and curls his upper lip (this is called the Flehmen response). Isn’t it amazing how these animals were created so that their bodies change with the seasons?! This entry was posted in farm, sheep and tagged breeding, fall, farm, ram, Raulie, sheep, Tunis. Bookmark the permalink.